Unacceptable actions need a veneer of plausibility to make them appear justifiable, no matter how outrageous they are in the cold light of day. The US unjustifiably justifies naked aggression and other hostile actions on the phony pretexts of humanitarian intervention, responsibility to protect (R2P), and democracy building – notions the imperial state and its partners abhor. In cahoots with the US and UK, hardline Ecuadorian President Lenin Moreno invented phony reasons to rescind Assange’s citizenship and asylum status – agreeing to hand him over to UK authorities for extradition to the US, flagrantly violating international law. 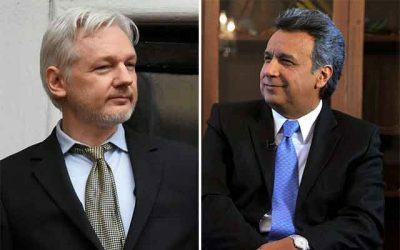 Former Ecuadorian Foreign Minister Ricardo Patino under former President Rafael Correa explained that Assange’s arrest “is part of Lenin Moreno’s agreement with the IMF,” adding he accepted Trump regime conditions for financial help to his country. They included colluding with the US on Venezuela, rejecting Latin American economic integration Washington opposes, and expelling Assange from his London embassy – in exchange for what Patino called a “miserable ($4.2 billion) loan from the (loan shark of last resort) International Monetary Fund” no responsible leader would have anything to do with. Moreno lied accusing Correa of spying on him by planting a hidden camera in the wall of his presidential office. Following Assange’s arrest, Correa called Moreno “the greatest traitor in Ecuadorian and Latin American history…his action “a crime humanity will never forget” or forgive. He betrayed majority Ecuadorians, breaking virtually every promise made while campaigning, why most people in the country despise him. Only 17% of the people trust him. Nearly three-fourths of Ecuadorians disapprove of how he’s governing. Assange is now detained in London’s high-security Belmarsh prison, Britain’s Gitmo, likely in punishing solitary confinement to harm him more grievously than already. Britain is mistreating an international hero like a dangerous criminal, the worst to come when extradited to police state USA. It’ll be challenged by his lawyers in UK courts. If unsuccessful, his case will likely be appealed to the European Court of Human Rights or European Court of Justice, the highest EU court. If extradited to the US, he’ll likely face torture and abuse, mistreatment similar to what Chelsea Manning endured for nearly seven years, more of the same ongoing for invoking her constitutional rights to stay silent. Once in US custody, further charges against Assange are virtually certain under the long ago outdated Espionage Act. What’s going on against him, Manning, and countless other US political prisoners is what tyranny is all about, how the US, UK and their imperial partners operate – by their own extrajudicial rules exclusively.